There are 2 types of Wobbegong sharks around Sydney. The Spotted Wobbegong and the ornate wobbegong. 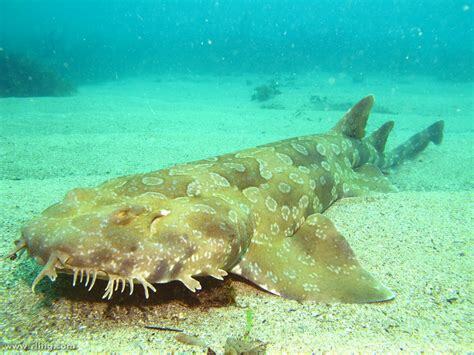 The Spotted Wobbegong can be recognised by the skin flaps around the snout margin and the distinctive colour pattern of dark saddles and white rings on a yellow to a greenish-brown background. It is about 20 cm in length when born and reaches a maximum size of about 3 m.
Feeding occurs mainly at night and includes prey items such as fishes, crayfish, crabs and octopuses. Spotted Wobbegongs live in shallow coastal waters down to about 100 m depth. They often lie on sand or rocky reef bottoms and are frequently seen by divers. This species occurs along the southern coastline of Australia from southern Queensland to south-western Western Australia. It is possibly endemic to Australia. Records from Japan and the South China Sea are probably errors. The genus name Orectolobus comes from the Greek words orectos, meaning stretched out, and Lobos meaning a rounded projection or protuberance. The genus name most likely refers to the barbels on the head. The species name maculatus comes from the Latin word macula which means spot, and refers to the shark's spotted colouration. Wobbegong is an Australian aboriginal word.